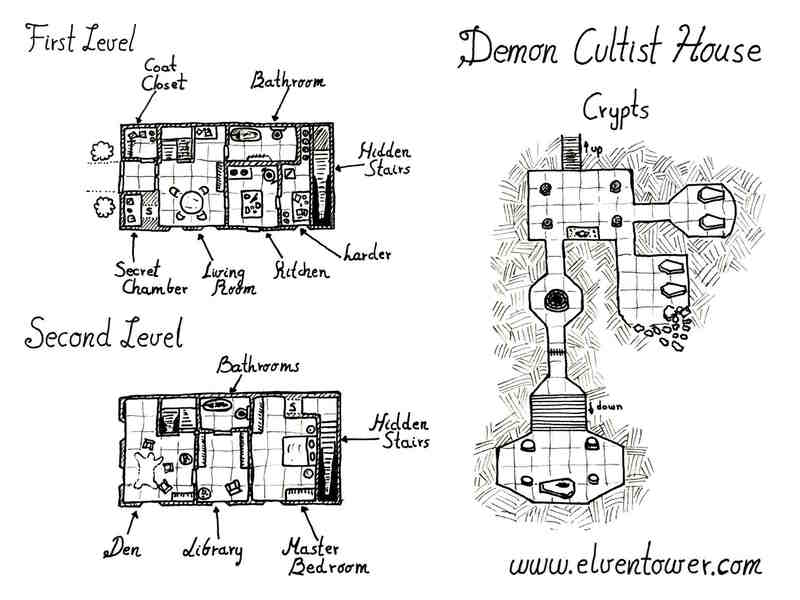 This is the floor plan of a demon cultist house. This person is a respected member of the community. Neighbors and townsfolk do not suspect his involvement in the dark arts, such is the secrecy of his cult. The house appears normal, if not a little wealthy. The first story of the house looks regular. The only secret is the secret chamber connected to the living room. It’s used to keep important documents and gold safe. Second floor is designed to appear normal too. In the master bedroom there is a secret door that leads to the hidden stairs. They descend to the family crypts, deep below the house’s foundations. In the crypts, the first chamber holds a dark altar, dedicated to an evil god or fiend. A long time ago, these crypts used to house important dead family members. For the last decades, powerful members of the cult have been occupying the family coffins. One of the underground chambers suffered a collapse a few years back and has not been repaired. Cultists pray and make offerings to the dark altar and in response; entities from beyond send them shadow servants, who emerge from a dark well set in the underground hallway. Shadowy servants prey the crypts and may attack any non-cultist at any time. The last room holds the coffin of the long dead cult founder. The main objective of the cult today is to gather information to perform a ritual that will let the ancient founder come back to life. You can find this map in High resolution in my patreon account. My mapping ventures are funded through Patreon, It is thanks to people who like my work that I am able to continue mapping and providing RPG original experiences to people all over the world. If you like what I do, consider getting involved and backing me. What you get is impressive hi-def versions of my maps to be used in your RPG games (these have lower resolution), and the satisfaction of helping the rpg community grow bigger and stronger. Help me get funding and enjoy hi resolution version of all my work.